A network upgrade doesn't have to be a costly overhaul. Modernizing your network can actually save your organization time and money in the long run. It might be time for you to consider a network makeover - faster internet, greater mobility and the flexibility to grow into future technologies are only a few of the benefits to upgrading. Networks now must support voice, video, and mobile devices to allow for faster collaboration and retrieval of information. An improved network will lead to increased employee productivity, faster collaboration, and nimbleness that can help you remain competitive. 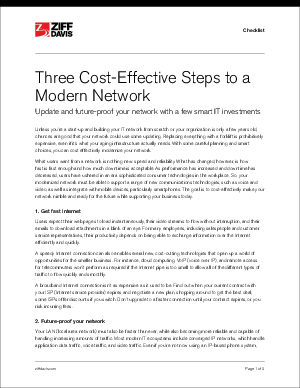 This list of three cost-effective steps to a modern network can help you optimize your network today and accommodate all of tomorrow's technologies. Access the exclusive report here.